Thermaltake receives “TweakTown Best of Computex 2013” award! Victory for the NIC C5 Non-interference Cooler! 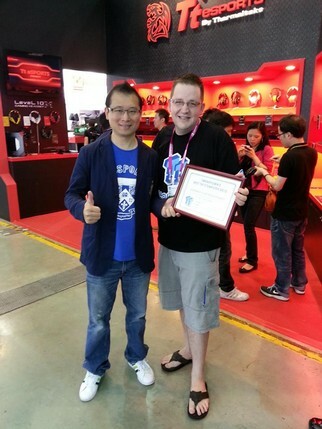 Taipei, Taiwan – June 14, 2013 – One of the world biggest tech media website－TweakTown recently announced its first “Best of Computex 2013” awards to celebrate the popular COMPUTEX Taipei 2013. 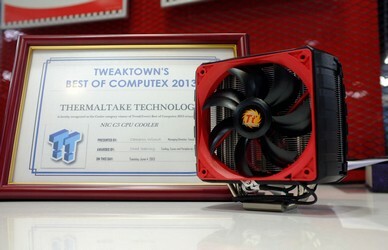 Thermaltake, as the industry leader in computer thermal solutions, highly praised by TweakTown editors among numerous cooling products, honorably wins“TweakTown Best of Computex 2013” with latest NIC C5 Non-interference Cooler! 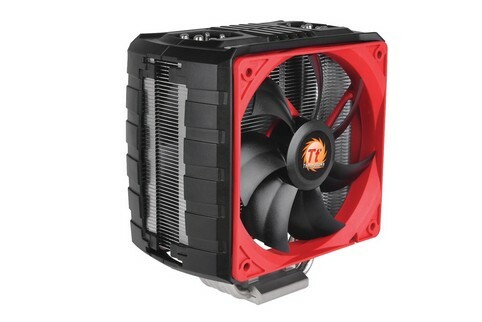 Thermaltake once again demonstrate advanced cooling technology with the world’s most desirable and value-retaining trend. “NIC C5 Non-interference Cooler” is fully compatible with RAM of all kinds, ideally for power users who fill their RAM slots with taller high-end overclocked RAM. The slim tower side flow design efficiently optimizes cooling performance, solving the problem where high performance RAM and CPU coolers cannot co-exist in the past. It achieves the best RAM clearance allowing users to install high end overclocking RAM with ease. Heat is conducted from the CPU onto the cooler through the thick nickel coated copper base and then onto the aluminum fins with 3–5 Φ6mm U-shaped heat-pipes. This ensures the best possible heat dissipation. Furthermore, users can opt for something smaller and cooled with a single 120mm fan, or go for coolers that have shrouds to contain the air flow, or go with a pair of 120mm fans to allow for the best performance of NIC C5. Aluminum fins are specially designed in a curved shape to reduce backpressure and at the same time maximize airflow through them. The 0.4mm thick aluminum fins also increase the overall thermal dissipation area. In addition, integrated 120mm VR fan is contacted to an adjustable fan speed knob where the fans speed can be manually adjusted from 1000-2000rpm. Convenient tool-less fan clip design makes installation a breeze. “NIC C5 Non-interference Cooler” indeed brings the air cooler industry another level towards silence, performance and compatibility!